Pencil eyeliner is, by far, the easiest type of liner to use. But just because it’s a pencil, something we all use, it doesn’t mean it’s as easy to use on your eye. Anyone who’s tried eyeliner for the first time knows this all too well. Both have the same ease of use. If you’re using your liner to make a cat eye or otherwise sharp edge, a pencil will be better. The twist up liners stay “sharp,” but you can’t make then pointed like an actual pencil. If you’re just drawing along your lash line, however, both are just as good. Before I get to actually applying the liner, let me first mention when to apply the liner. First, always apply your eyeshadow primer all over the lid. I’ve learned that, if you want a more subtle effect, apply your liner FIRST, then cover you lid in shadow. This allows the liner to slightly define your eyes, but you aren’t left with a harsh, noticeable line. To amp up the effect a little bit, use a thin, angled eyeliner brush to sweep eyeshadow that’s the same color as your liner along the base of your lashes. This will give you a little more definition that’s softer than the pencil liner alone. For a more intense effect, apply your choice of eyeshadow all over your lid, and then draw liner along your lashes. You can also use an angled brush to sweep shadow that’s the same color as your liner on top of your liner to soften the line. This will help your liner stay on longer, and it will correct any jagged marks you may have left when drawing on your liner (hey, nobody’s perfect!). Maybe you’ve heard/seen this term before. You’ll see two black pencils next to each other. One says kohl. What makes it different? When you see kohl, know it means “smudgy.” It’s a softer pencil. 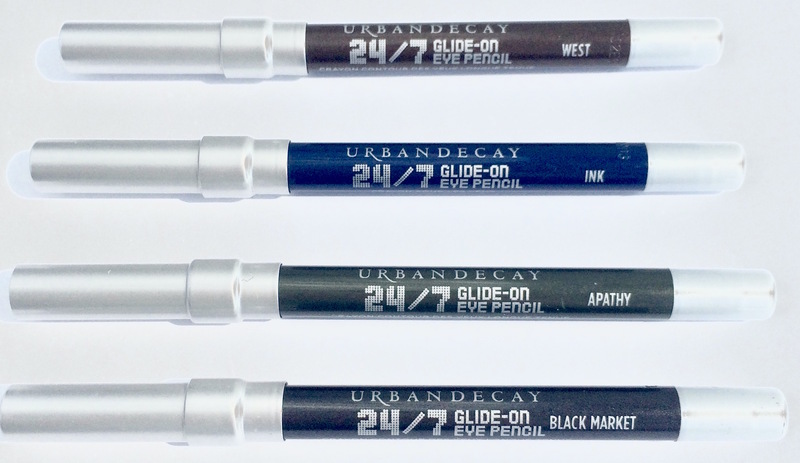 These are great for creating smoky eyes. They’re also a nice choice if you want to be able to smudge your eyeliner, such as if you aren’t so confident that you can draw a perfectly straight line. Usually kohl pencils are available in only a few colors. Mainly black and brown, sometimes you can find a navy blue, green, purple, or white. Again, put eyeshadow primer all over your lid. Unlike with a pencil liner, you’re going to always want to apply shadow all over your lid first. Liquid liners aren’t amenable to having shadow place on top of them (as they usually dry with a more glossy finish). After putting on your shadow, use your non-dominant hand to pull your eyelid taut (like with your pencil liner). Then use your dominant hand to draw the liner on. Place the liner just on top of your lashes near the inner part of your eye, with the thin tip near pointed towards your nose. Instead of drawing on your lashline with the pointed end, place the liner flat against your lashline. The handle of the liner should be more parallel than perpendicular to your lashline. Instead of “connecting the dots” like we did for pencil liner, slowly drag the felt tip along your lashline. Push the felt tip into the base of your lashes. When you’ve finished, and you see any gaps or jagged edges, repeat the process, concentrating on those areas. Also, don’t fully open your eyes immediately after applying liner. Leave them mostly closed for a few seconds to allow the liner to dry. Liquid liners leave a harsh, more graphic line than pencil or gel/cream liners. You generally can’t apply any type of shadow over them. So you can’t really “soften” the line with shadow. Liquid liners are great for drawing precise lines, such as for cat eyes. Gel or cream liners come in little pots that require a separate applicator to apply. You have a few different options when choosing how you wish to apply this type of liner [See my article Time to Brush Up: The Deal with Makeup Brushes]. Again, apply shadow primer, and then your shadow. Gel or cream liners, however, can have shadow placed over them. Using your chosen brush, gently dip the brush into your pot and pick up some liner on your brush. If you’re nervous you may have picked up too much liner, pat the brush on the back of your hand or on a tissue. Then place the brush on your lashline near the inner part of your eye. Working your way out, draw little strokes. Here, we are once again “connecting the dots.” Draw short little strokes. If you miss any spots, go back and fill them in. Some gels/creams dry more quickly than others. If they dry more slowly, you might be able to better smudge and blend the “dots” together. When you’re done, regardless of whether you’ve applied you eyelid shadow before or after you applied your liner, you can sweep some shadow that’s the same color as your liner along your lashline. Again, this will fill in any gaps, soften the edge of your liner, and help your liner last longer. Previous Previous post: Eyeshadow Palettes: How to use those 2, 3, 4, or 5 colors! Next Next post: Waterlining, Tightlining, and French Lining OH MY!